For various reasons, I haven’t had the chance lately to do any blogging. So in order to at least add something new, I’ve decided to recycle the text of a very old article, first published in 1997. I’ve made no effort whatsoever to update it, so please keep this in mind (though, because the original article didn’t include any citations or references, these have been added). Here we go. It is often difficult to visualise the life appearance of extinct animals: quite simply because many of these animals are profoundly different from any we have living with us today. Perhaps, out of all the extinct types of Mesozoic reptile, ichthyosaurs are the easiest to visualise. Certain living marine animals - the speedy, open-water dolphins, lamnid sharks [Great white and relatives] and scombroid fishes [the tuna-mackerel group] - possess the ichthyosaur body shape and surely move in an ichthyosaur-like way. So alike are all of these groups in their shape and presumably their behaviour that is has proved irresistible for artists to depict ichthyosaurs as ‘Mesozoic dolphins’. They are shown travelling in schools, porpoising from the waves, and smoothly powering themselves beneath the surface with their forked, shark-like tails. But try and imagine now how different things might look if ichthyosaurs did not swim in this way at all, but propelled themselves with their powerful forefins instead. They did not swim by fast side-to-side movement of the tail, but flew underwater like turtles or penguins. This idea must sound unusual to the uninitiated. In recent years, however, it has been seriously proposed and has won a fair deal of acceptance in the community*. For my third year dissertation at the Southampton Oceanography Centre (University of Southampton), I decided to investigate this suggestion and assess for myself how likely, or unlikely, it really was. Were ichthyosaurs really underwater fliers? * That's not true, and it wasn't in 1997 either. The suggestion that ichthyosaurs may have flown owes itself to German palaeontologist Jurgen Riess who published his ideas in a 1986 study on ichthyosaur biomechanics and phylogeny (Riess 1984, 1985, 1986, Riess & Frey 1991, Riess & Tarsitano 1989). Riess presented new, wing-like reconstructions of ichthyosaur fins. Previous discoveries, some described as long ago as 1841, had shown that the soft tissue of ichthyosaur fins extended well beyond the fin skeleton. There seem to have been rigid plate-like structures and fibres along the fin’s leading edge, creating a stiff and narrow extension along the anterior-most border. Stiffening rods apparently supported a gently tapering, flexible posterior-most border to the fin that was much wider than the leading edge. In cross-section, these fins may have been hydrofoil shaped. In order that such fins could flap up and down to enable propulsion, constricted fin bases would be required. Riess argued that this was indeed the case [the drawing at the top, depicting the Triassic ichthyosaur Shonisaurus as an underwater flier, is by Dino Frey and from Riess (1986)]. Though aspects of the fin’s internal structure may have been common to all (or nearly all) ichthyosaurs, ichthyosaur fns do vary a great deal in shape. However, one trend that might be observed in the evolution of the ichthyosaur fin is the addition both of more and more elements (hyperphalangification), and of more and more digits (hyperdactylification). A plausible advantage of both conditions might be that a limb surface would become broader if new elements were added to its sides, or longer if more elements were added to its distal-most end. Both patterns would, in theory, be advantageous to an underwater flier. Greater broadening of a fin could provide it with more propulsive power, and an increased length could help create a more wing-like plan: by the creation, say, of a slim, pointed fin tip. Certain ichthyosaurs carried the two patterns to the extreme, Platypterygius, a cosmopolitan genus from the Cretaceous, had up to 10 digits, the longest of which contained more than 30 phalanges, per forefin. Extra bones were added also to the forearm, making that part of the fin broader too. The evolution of these wide, elongate wing-like fins may be interpreted as increasing specialisation toward the underwater flight mode of propulsion. So far so good, but to ‘fly’ animals need more than a wing - they also need a powerful, well braced pectoral girdle as well as strong muscles. Did ichthyosaurs possess such attributes? Articulated ichthyosaurs demonstrate that the pectoral girdle was a robust construction with vertical clavicles [collar bones] and scapulae [shoulder blades], so there was a firm base for the articulation of powerful forefins and their musculature. In some ichthyosaurs, muscle attachment sites on the pectoral girdle were quite pronounced, and fin muscles may even have extended onto the ribs too. So, not only were ichthyosaur fins wing-like in shape with a sometimes broad surface area, they were connected to a robust, torque-resistant skeletal framework and were controlled by well-developed muscles. A morphological configuration that, in its basic principles, is not unlike that of underwater-flying turtles or penguins, or indeed from airborne birds, bats and pterosaurs. The case for ichthyosaur flight looks good. Or, it would do, were there not some modern-day forms that possess many of the same features as the ichthyosaurs, but which do not fly. 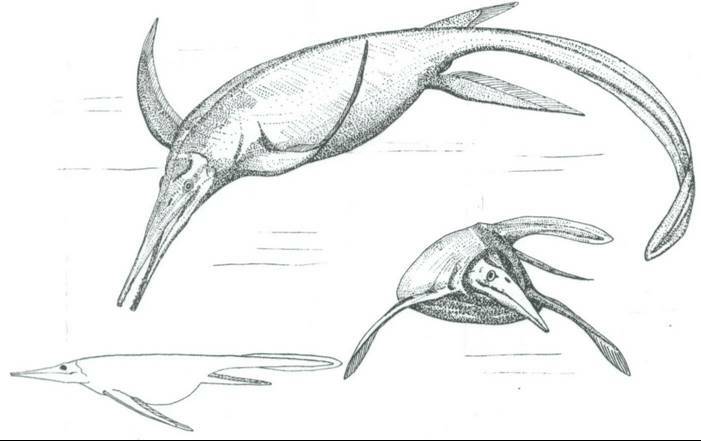 Part of Riess’ case for flight in ichthyosaurs was based on analogy with two living animals: the Australian lungfish (Neoceratodus) and the Amazon river dolphin (Inia). Both animals have wing-like fins strikingly similar to those of some ichthyosaurs and Riess mistakenly believed that both forms were underwater fliers. 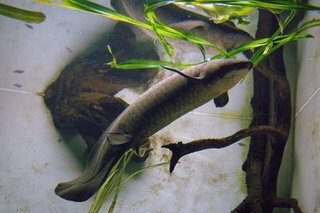 His reasons for thinking so are complex and buried deep in the labyrinthine depths of technical zoological literature, but having surveyed the literature, discussed the issue with colleagues, and spent many hours observing Inia on video, I am certain that the idea of either flying lungfishes or dolphins has been based on misinterpretation. Mary Wade, a palaeontologist who has published some of the most important work on Platypterygius, came to the same conclusion in a 1990 paper of hers (Wade 1990). So what does this all mean? Well, if there are living animals that possess wing-like fins yet do not fly, then a direct correlation between wing-like fins and flight does not exist. Wing-like fins, big fin muscles and robust pectoral girdles can instead be explained as adaptations for manoeuverability - something very much evident in the behaviour of Inia. Lengthening and broadening of fins is not proof of flight, either. The hyperphalangic condition occurs in certain whales (it is particularly marked in the Longfin pilot whale (Globicephala melas)), animals that most definitely are not fliers. Furthermore, some underwater fliers (e.g., sealions) do not exhibit hyperphalangy. So there is no clear correlation between hyperphalangy and flight. Hyperdactyly - the broadening of fins - could well evolve as an aid to small-scale local movements. Most types of fish use their fins extensively for this purpose, as do whales with their flippers. 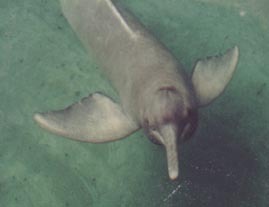 As an animal that spends a great deal of time making small-scale local manoeuvres in its complex, three-dimensional watery home, Inia is especially telling in that it may actually be taking part in a trend toward hyperdactyly, as it bears an extra bone in its flipper that is to all intent and purposes a sixth digit. Those ichthyosaurs with extra-wide fins were probably spending a great deal of time moving slowly, like Inia, perhaps while investigating prey on the seafloor. Furthermore, despite Riess’ fin reconstructions, ichthyosaurs with preserved soft tissues show that the fin attachment to the body was broad, rather than narrow. Up and down movement was therefore somewhat restricted, and not suited for vigorous flapping. One clear correlation that does appear to be true for swimming vertebrates concerns that tail. Essentially, if an animal has a propulsive surface on the end of its tail, it uses it. Riess thought that some ichthyosaurs, his example was the Lower Jurassic genus Leptonectes*, both flapped with the forefins, and used the shark-like vertical tail to steer. However, studies of ichthyosaur locomotion, notably those by Christopher McGowan and Michael A. Taylor, have demonstrated that the ichthyosaur tail was a powerful organ of propulsion. Indeed, it is hard to explain the evolution of this important and superbly hydrodynamic feature if it was used merely for steering rather than for active and constant use. Further confirmation of tail-propelled swimming in shark-shaped ichthyosurs comes from work by Motani, You and McGowan (Motani et al. 1996). They plotted ichthyosaur fineness ratio [body length/body height] against tail height/length ratio for different kinds of ichthyosaur and shark. Not surprisingly, the advanced shark-shaped ichthyosaurs (e.g., Stenopterygius) grouped tightly with lamnid sharks - exactly what we would expect if both groups were hydrodynamically adapted for the same style of propulsion. The result would surely have been different if these ichthyosaurs were not shark-like in their style of swimming. * This genus was still known as Leptopterygius Huene, 1922, when Riess was writing, a name now known to be preoccupied by a fish named by Troschel in 1860. For a previous post on ichthyosaurs see Ichthyosaurs wars and marvellous mixosaurs and Life in the Oxford Clay sea. Incidentally, given that Neoceratodus is mentioned in the above text I am morally obliged to direct you to Pharyngula’s Neoceratodus campaign. This animal (yes I know it’s not a tetrapod) is under significant environmental pressure. Coming soon… those long-promised posts on agamas, domestic dog origins and rhinogradentians. For the latest news on Tetrapod Zoology do go here. Motani, R., You, H. & McGowan, C. 1996. Eel-like swimming in the earliest ichthyosaurs. Nature 382, 347-348. Riess, J. 1984. How to reconstruct palecology? – Outlines of a holistic view and an introduction to ichthyosaur locomotion. In Reif, W.-E. & Westphal, F. (eds) Third Symposium on Mesozoic Terrestrial Ecosystems, Short Papers. Attempto Verlag (Tübingen), pp. 201-205. - . 1985. Biomechanics of ichthyosaurs. In Riess, J. & Frey, E. (eds) Principles of Construction in Fossil and Recent Reptiles. Konzepte SFB 230 Heft 4, pp. 199-205. - . 1986. Locomotion, biophysics of swimming and phylogeny of the ichthyosaurs. Palaeontographica Abteilung A 192, 93-155. - . & Frey, E. 1991. The evolution of underwater flight and the locomotion of plesiosaurs. In Rayner, J. M. V. and Wootton, R. J. (eds) Biomechanics and Evolution. Cambridge Uni. Press (Cambridge), pp. 131-144. - . & Tarsitano, S. F. 1989. Locomotion and phylogeny of the ichthyosaurs. American Zoologist 29, 184A (abs). Wade, M. 1990. A review of the Australian Cretaceous longipinnate ichthyosaur Platypterygius, (Ichthyosauria, Ichthyopterygia). Memoirs of the Queensland Museum 28, 115-137. Are Sumatran rhinos really ‘living fossils’?